Deep down beneath the choked streets of London was a railway which once ran busily for nineteen hours a day. It carried no passengers and its trains had no drivers or guards. Yet this seemingly strange system was one of the most successful railways in the world. 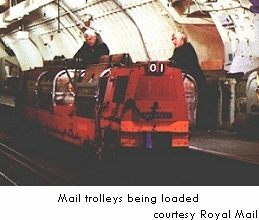 The Post Office underground railway was a unique solution to the problem of transporting large volumes of mail across a capital city. Designed solely for the movement of letters and parcels, its automatically controlled trains operated on a 6 1/2 mile (10.5Km) route between Paddington and Whitechapel. An average of 4 million letters were once carried each day between the nine stations on the line - serving two British Rail main line stations and major London sorting offices. The idea of transporting mail in tubes began many years before the Post Office Railway was even thought of. Way back in 1853 the first ever mail tube went in to service. Although it was only 225 yards (approx 206 meters) long and only 1.5 inch's in diameter and used the equivalent of a giant Vacuum cleaner to power the system it did prove very successful. Over the next few years various forms of this system were built and tested, even to the point of carrying passengers. So impressed by its success, the Post Office, set up a team to look at the possibilities of building a larger system between two of their buildings. This idea was dropped after they worked out the costs involved. 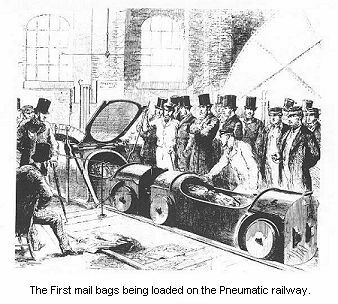 Just a few years later in 1859 the Pneumatic Dispatch Company was formed, with the aim of building a system to carry parcels and goods and perhaps even mail, if the Post office agreed. After building a test line at Battersea, London, the company went on to build a tube from their premises adjacent to the Post Office's, North Western District Office on to the Parcel office at Euston Station. Despite many problems with the system, a second line was built from Euston Station on to The General Post Office. All this time the Post Office would not guarantee any mail for the line. Eventually the Pneumatic Dispatch Company with little income was closed down in 1874. In 1899 another company, the London Dispatch Company, was formed with the idea of rescuing the abandoned lines, but this proved too costly and was wound up. But all was not lost, the tunnels that had been built, were eventually found a use, carrying electricity and telephone cables. Even back in the very early 1900's London had a very serious traffic problem and the Post Office soon realised the need of some type of system to transport mail between the major central London sorting offices. In 1908 a team of Post Office engineers visited the Chicago Freight subway system and a similar system in Berlin, Germany. Eventually in 1911 the plan was hatched to build a subway system some six and a half miles long from Whitechapel to Paddington and serving the main sorting offices on the route, with the option of extending the system at various points. And so it was, The Post Office Railway was born.